← Luther the Geek will eat Hannibal Lecter raw! Thanks to the resurgence of cult grindhouse films as a result of the Tarantino/Rodriguez double feature collaboration, the House of the Dead series takes the 4th console installment away from the cheesy b-movie feel and goes totally grindhouse, from the subject matter to the damaged film and bad cuts and edits. The game also seems to borrow from tons of other popular media. There’s a prison level that brought me back to horror survival games like Hunter and The Suffering. A swamp level feels like it’s actually inspired by the first House of the Dead movie (a trash film I LOVE). For someone like me, who has been waiting forever for the arcade light gun game Carn-Evil to get a console port, there’s a zombie carnival level here. A level on a train is a total rip off of Resident Evil Zero. The final level looks very much like the lab level in House of the Dead 3. The finale boss basically puts you in the film Dead Alive. There are even zombie nurses who appear to have strolled out of the hospital in Silent Hill. And of course, there’s a classic mansion level. The game is a blast if you pop your Wiimote into a light gun shell. But there are some issues. The clipping and slow down is TERRIBLE. It’s absolutely disruptive to your shooting and targeting. When out of bullets, you get a 1st person shooter graphic of your gun being reloaded on the bottom right side of the screen and it always seems to totally block the approach of a new zombie, who more than likely will nail you in this ‘sneak attack.’ Speaking of, reloading almost always takes place at the most inopportune moment, and again, you always seem to take damage as a result of reloading, even if you try to do it when there are no enemies on screen. And, while I never want to complain about loads of blood, sometimes the blood splatter is SO bad that it literally HIDES the approach of more zombies, and again, you totally take a hit by something you can’t see approaching as a result. Argh! Every now and then there is a green icon on screen that slows down all the action when you shoot it, giving you a chance to carefully pick off your enemies, but more often than not, the icon seems to be placed where you least need it because the entire temporary slow-mo has very few enemies to shoot! Then there are the gold icons, health packs and grenades you can shoot to acquire them. For some reason, you can easily pick zombies off with direct hits to the head, yet these bonus targets are immune to perfect accuracy! WTF? 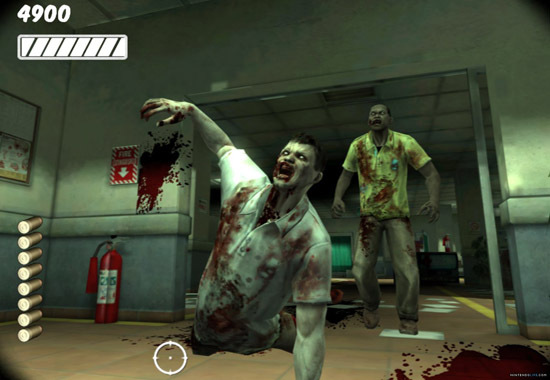 And if you focus too much attention on shooting them, you fail to notice the zombies bombarding you. On top of all those issues, what’s sorely missed in this game is the ridiculous but beloved “Don’t come!” exclamation made by the human civilians in all the other games when they’re being attacked. They could have used this classic line at least once in this game and had a ball with it, allowing the main characters to make some dirty quip in response! I can’t believe they didn’t jump on that opportunity. Oh yeah. 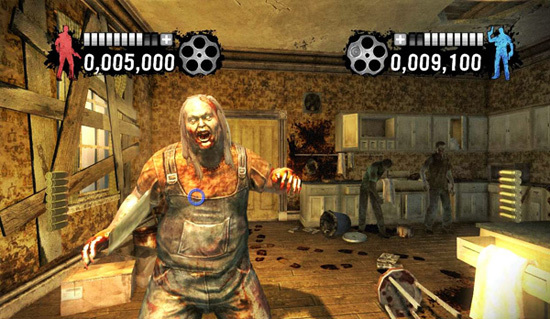 I may seem greedy and never satisfied, but the ORIGINAL House of the Dead game absolutely should have been a bonus included with this game, because it’s the only one that hasn’t at this point been ported to a modern console. Okay, that might sound like a lot of complaints, but really, you can’t go into a light gun game expecting anything more than a bunch of zombie blasting fun. 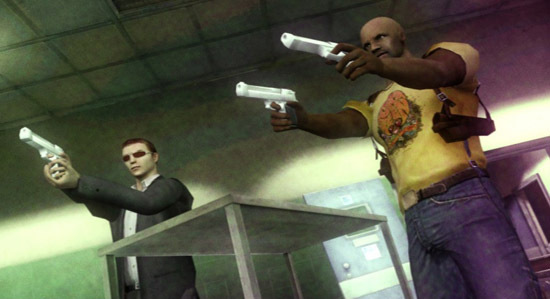 House of the Dead Overkill gives you that along with really campy dialog and situations. I’d suggest getting two light gun shells and a friend and make it a party. This entry was posted in Johnny You ARE Queer - Gay Thoughts, Movie Times & Television Schedules - Staying Entertained, The Evil of the Thriller - Everything Horror, What I'm Doing With My Joystick and tagged House of the Dead Overkill, video games, Wii. Bookmark the permalink.